Developing leaders on campus since 2002 — join the legacy! Project LEAD is a three day program of workshops designed specifically to assist students in developing leadership skills and getting involved on campus from day one. This program allows first-year and transfer students to move in early and get a head start adjusting to UIC and living on campus. The dates for Project LEAD are August 18-21, 2019. Project LEAD participants will receive a t–shirt and meals for the duration of the program. Registration cost is $80, and scholarships are available if financial need can be demonstrated. If you want to learn more about Project LEAD, stop by the RHA (Residence Hall Association) table at Marketplace when you are on campus for Orientation, or contact Johnny Quintanilla. 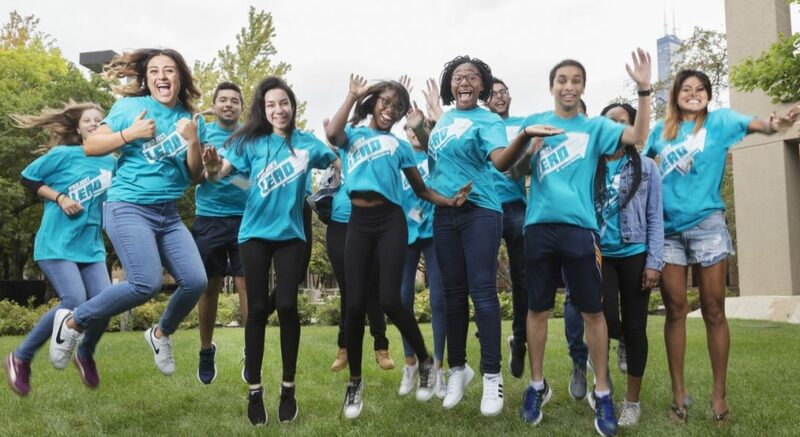 Project LEAD is a three-day program designed specifically to help residents learn about leadership, become aware of opportunities to get involved on campus, and get to know each other. This program allows first-year students and transfer residents to move in early and get a head start adjusting to UIC and living on campus. Project LEAD move-in is Sunday August 18th. The last day of the program is Tuesday August 20th. The next day, August 21, Project LEAD participants will serve as members of our Flames Welcome Crew to further get involved with the Campus community. Where will I check-in and move into? Students assigned to Commons North (CMN) Commons South (CMS), Commons West (CMW), and Courtyard (CTY) should check-in at the East Area Residence Life Office, located in the Atrium of the Student Residence & Commons (SRC) complex. The address is 700 S. Halsted Street, and the phone number is (312) 355-6500. Students assigned to James Stukel Towers (JST) check in at the JST front desk. JST’s address is 718 W. Rochford Street, Chicago, IL 60607, and the phone number is (312) 355-6000. This is a relatively new street, and may not be in the databases of all GPS systems yet. To get directions, please search for the intersection of Halsted and Roosevelt or the address of TBH (below). Rochford is east of Halsted, across from Thomas Beckham Hall and between Roosevelt Road and Maxwell Street. Students assigned to Marie Robinson Hall (MRH) should check in at the MRH front desk. MRH’s address is 811 W. Maxwell Street, Chicago, IL 60608, and phone number is (312) 355-6200. Students assigned to Thomas Beckham Hall (TBH) should check in at the TBH front desk. TBH’s address is 1250 S. Halsted Street, Chicago, IL 60607, and phone number is (312) 355-6100. Students assigned to Single Student Residence (SSR) or Polk Street Residence (PSR) should check-in at the West Area Residence Life Office, located on the ground floor of PSR. The address is 1933 West Polk Street, and the phone number is (312) 355-6400. We will provide passes for temporary drop off parking so residents can unload their vehicles. Afterwards, vehicles must be moved to a campus parking lot or garage. You will be able to park at these locations for a small fee of $12. You will sign-up for a move-in time through Sign-up.com. This link will be provided in your welcome email along with other important information about the upcoming program. You will be able to move in between 8:00 am-4:00pm. Following your assigned time will help us prepare for your arrival and ensure a smooth check in. By what time do I need to be finished moving into my room? Move-in should conclude at 4:00 pm. At 4:30 pm on August 18, 2019, you will meet at the desk where you checked in, and a Project LEAD Leader will take the group to the Welcome Session. Am I moving in my permanent room for the Fall? Yes! When you move in, you will move into your Fall Assignment! What type of help will I receive when I move-in? We will have staff on hand to assist you with moving in. Additionally, we will have a limited amount of move-in carts available to be check out. Please have your I-card readily available. What does the cost of Project LEAD cover? The registration cost of $80 covers your meals, night time entertainment, t-shirt, and supplies our presenters may need during sessions. When do I pay for the experience? Your student account will be charged the registration cost. You will pay the costs through your UIC Portal. If you need additional in paying, contact Student Accounts Receivable. Yes. Part of attending the program requires you to attend all of the sessions including meals. Failure to do so will result in an interim room charge for each day to your account. Is food included in the program? During the program, we provide meals for lunch and dinner. We also provide to-go items, such as granola bars and pop tarts and fruit, in the morning. What if I forgot that I had a dietary concern that I did not put in my registration? Please make sure to email Bhavin Patel at bpate38@uic.edu to let us know by August 11, 2019. For the program specifically, we provide all the materials you need. What is Leadership Practices Inventory (LPI)? LPI gives students the opportunity to understand their top leadership traits, and how they interact with others. How do I take the LPI Assessment? Please be on the lookout for another email giving you instructions on how to access your activation code, and step by step instructions on how to take the assessment on the LPI website. Come to the retreat with your results printed or written down. How do I know if I received the Project LEAD scholarship? The Project LEAD scholarship is based off need. A separate email will be sent to students that applied for the scholarship notifying them of the selections. Can I still apply for the Project LEAD scholarship? No. The application for the scholarship are due on July 21st, 2019. Contact Johnny Quintanilla at johnnyq@uic.edu.